The world of software and tools for marketing and business can be overwhelming. It’s definitely a good thing – there are so many amazing and helpful tools out there to help us make the most of our work and time – but on the other side of the coin, all of this variety can be confusing. In this blog post, I will be talking about essential digital marketing tools – and share some of my favorites. Some of these tools are essential because there really is no other way to perform certain tasks without them – like marketing automation tools, for example – while others help you be more productive overall. Why do you need it? Optimising your website and blog for search engines is essential, as Google (and, I guess, Bing and Yahoo!) is one of the top sources of organic traffic. Good ranking for the right keyword can make a huge difference to your traffic and lead generation. Keyword research helps you understand what keywords your target audience is using and it will allow you to create better-targeted content. Not only that, but it’s also an essential tool if you’re going to create PPC campaigns to promote your business online. Ubersuggest is a newly-revamped keyword research tool that can be used both for SEO and PPC purposes. However, one of the biggest draws of using Ubersuggest compared to other tools is that it doesn’t just give you a range of results, but actual exact numbers to help you make better-informed decisions. To filter your results, you can add negative keywords to be excluded from your search, and you can also search within the results. Why do you need it? An all-in-one marketing dashboard that can help you become more productive and allow you to manage all of your digital marketing efforts from one dashboard; which is not only a great time-saver, but it also helps you focus on the tasks that need doing and it keeps you organized. Lately is an all-in-one marketing dashboard built for collaboration; in short, Lately helps you plan, implement, and analyze your digital marketing efforts. One of the really cool features here is that you can quickly repurpose content (such as blog posts and press releases) and create social media posts that are ready to publish, hashtags and all with the Automatic Social Post Content Generator. Why do you need it? Social media is an amazing source of traffic, leads, and engagement; not to mention, it’s a great platform for establishing connections with influencers, bloggers, and for managing (part of) your customer service. However, without software to help, it’s also very time-consuming. Social media management tools allow you to manage all of your accounts from one place, schedule updates, collaborate with teammates, manage your mentions, and set up social listening. Agorapulse is a full-suite social media management tool that works with Twitter, Facebook, Instagram, Google+, LinkedIn, and YouTube. You can pretty much handle all of your social media with one dashboard – from monitoring your mentions in a social inbox to checking your analytics and creating customized analytics reports. Plus, you have access to a social media calendar for planning your content ahead of time and team collaboration tools to handle your mentions and publishing as a team. Also worth mentioning – you can schedule and queue updates for your Instagram business account just like you would for any other social network (no reminders + logging in on your phone each time to post the image). If you use social media for marketing purposes – and especially if you have multiple accounts – this type of tool is essential, otherwise, you’re going to lose a lot of valuable time. Why do you need it? Marketing automation is an incredibly valuable tool for businesses, as it allows you to nurture your leads into becoming your customers – pretty much automatically (once you’ve set it up) so you can focus on your other tasks. This way, you don’t need to work on nurturing each of your leads individually and instead use a tool that does it all for you. But it’s not just about saving time; depending on how well you’ve set up your drip email campaigns and what triggers you’ve set up, marketing automation can help you nurture your leads better and faster than you could manually. Hubspot offers a host of different marketing tools – but we’re here for the automation, which is probably also the tool they’re best known for. This powerful marketing automation tool allows you to set up email drip campaigns easily – no coding knowledge or skills necessary – based on dozens of different triggers and conditions so that you can send the right marketing message to the right person, at the right time. Hubspot also lets you automate other, simpler tasks that can ultimately make a big difference to your working days; for example, automate lead scoring, trigger internal notifications for your team, and manage your data in bulk. Overall, a great option for creating powerful and complex workflows to help you get better results for your business, especially as you can also use their CRM tool to connect everything. Why do you need it? Leads are the lifeblood of your business – you need them to keep coming in to keep growing as a business. Lead generation forms like landing pages, opt-in forms, pop-ups, and welcome mats allow you to collect your website visitors’ information so you can contact them with targeted messages and move them along the sales funnel until they become your customers. As well as set up email marketing and marketing automation so you can handle it all with one tool. The best part is that you don’t really need any design knowledge to get started; you can start from scratch or use one of their templates to create forms, contests, and promotions easily, and use the drag and drop builder to customize them to your hearts’ desires. Use it to create landing pages to boost your sales, online forms and pop-ups to collect lead information, and to set up email marketing and marketing automation campaigns. Some types of tools and software are essential to most any type of business with an online presence, whether it’s b2b or b2c. Social media, search engines, and email marketing are all important sources of traffic and you need all the help you can get to not only save time marketing your business, but also to improve your overall results. What are some of the digital marketing tools that you can’t live without? Highly regarded on the world speaker circuit, Lilach has graced Forbes and Number 10 Downing Street. She’s a hugely connected and highly influential entrepreneur. She is listed in Forbes as one of the top 20 women social media power influencers, named one of 10 top digital marketers by Brand24 and was crowned the Social Influencer of Europe by Oracle. She is listed as the number one Influencer in the UK by Career Experts and is a recipient of a Global Women Champions Award for her outstanding contribution and leadership in business. ABOUT BRYANBryan is a Social Business Strategist, author, speaker and President/CEO of PureMatter in Silicon Valley. 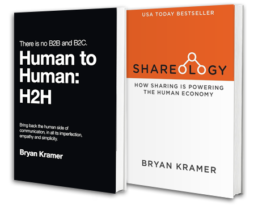 His first book, “There is no B2B or B2C: It’s Human to Human #H2H” reached the Top 1% of business books its first week on Amazon; he is releasing his second title “Shareology: Understanding Sharing to Power Human Business”. Free video series, enter your info below. Yes, I consent to receive marketing from this website. Thank you, your first video is on its way. Go check your email, the first video will be emailed to you shortly.